Update on Girona Event & ANOTHER Exciting Announcement! I know, I know, we’re just overflowing with good news here!!! On the original announcement I wrote that registration is required, but the powers that be haven’t been able to pull it together, so… uh… never mind that, just show up! The event will be filmed and I’m told it will broadcast via FB Live, but I’m not sure from which page or account! I will update you when I have more info. Leah is hard at work trying to get the landing page of Moving Stones up and running, and when that’s online you’ll be able to sign up to receive updates on our continued schemes activities–which will probably include additional events/classes/seminars I’ll be offering remotely. I’ll keep you posted! And now, the other exciting announcement! Well, actually, it’s sort of two in one. 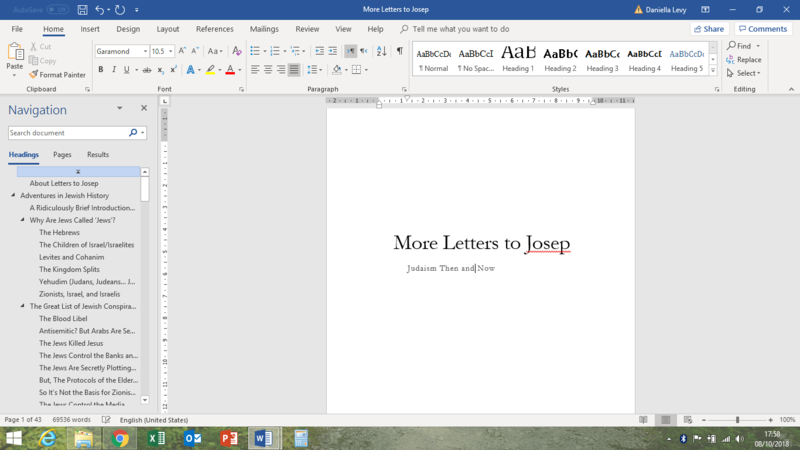 Part I is something I’ve mentioned in passing here and there, but now I can announce it officially: Kasva Press, the publisher of my novel By Light of Hidden Candles, is going to be republishing Letters to Josep: An Introduction to Judaism this coming January! Yael even made me a poster! What this means practically is that the previous edition (which I self-published) will go out of print, and a new version of the book will become available through Small Press Distribution (which will then distribute to Amazon and everywhere else you can find By Light of Hidden Candles). It won’t be significantly different from the previous version; we’re just going to polish up the prose and layout a bit more and update the information where necessary. It’s Part II that’s a little more exciting for you guys…. While the good folks at Kasva Press and I were discussing what we might like to change about the new edition of LtJ, the editor asked me if there was anything I might want to add to it. So I was scrolling through the archives of the blog, looking at letters that had been cut from the book or written since it was compiled, and I started copy-pasting, and long story short…..
…turns out, I wrote another entire book without even noticing. 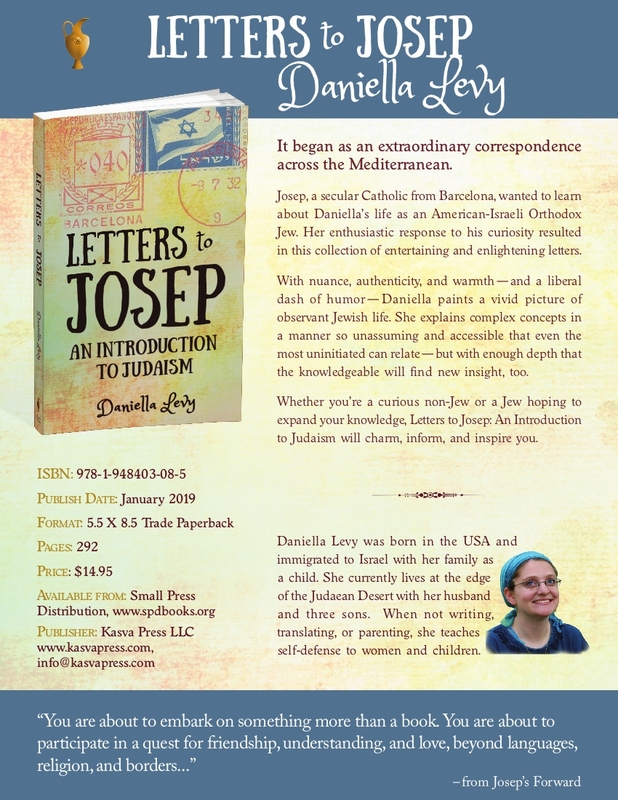 More Letters to Josep is of a collection of letters/essays on various aspects of Judaism and Jewish history. The letters are divided into four sections: Adventures in Jewish History, Life in Israel, Being Jewish in a Modern World, and Conversations with God. Because the passage of time is a common thread connecting the letters, the working subtitle is Judaism Then and Now. Like its predecessor, it will have some “bonus features”; for instance, a compilation of the Whatsapp messages between Josep and me during the independence referendum drama and its aftermath. (I got the idea from this short documentary!) The manuscript is still a work in progress and we still have to make some decisions about what to include and what not to include. (So feel free to make suggestions for additional things you’d like to see in it!) We’re roughly aiming to release it about a year after LtJ’s re-release.